For U.K. investors the appeal of a long-term holding in Whitbread (LON: WTB) stock boils down to two things. The first is the enviable list of brands under its ownership, which includes names such as the Premier Inn hotels, Costa Coffee and pub/restaurant brands Brewers Fayre and Beefeater Grill. The second is the business performance over the past five or so years; with the company growing revenues by around 13% a year and earnings-per-share and dividend growth coming in at a couple of percentage points higher still. When you consider that the peer group is largely made up of stagnant pub company stocks, and that Whitbread generates almost 100% of revenues from the domestic U.K. market, those figures stand out. The only downside, which regular readers will probably already guess, is that it set up the dreaded growth trap scenario. Back at the start of 2012 the shares were changing hands for approximately £16 each on normalized annual earnings of £1.24 per share. By the end of the first quarter of 2015 the shares had risen to £54 each; backed up by earnings of approximately £2 per share. In other words the annual price-to-earnings ratio had expanded from around 13x earnings to 27x earnings in the space of about three years. The upside is that it fuels short-term shareholder returns that far exceed the underlying performance of the business. Earnings growth over that year three stretch came in at just under 17% on a per share basis whilst the company paid out around £1.85 per share by way of cash dividends. Assuming the P/E multiple remained static shareholder returns would have therefore been around 20% per year during that particular period. In reality the expansion from a value multiple of 13x earnings to 27x earnings added an extra 30% to annual shareholder returns (assuming dividends just piled up in your broker account and weren’t reinvested into more shares). To get a feeling for just how huge that effect is, even over a three year period, consider it purely in monetary terms. On a starting investment of £10,000 at the beginning of 2012 it’s the difference between ending up with £34,900 compared to £17,170; the former figure being actual shareholder returns and the latter being a hypothetical scenario in which the P/E ratio remained constant. Let’s compare that to a similar stock such as Starbucks, where investors have bid up the shares to around 30x earnings on the back of recent (i.e. 5-year) annual revenue and earnings-per-share growth of 12.8% and 19% respectively. Now in terms of the quality of Starbuck’s underlying business we’re talking about 30% returns on invested capital and 20% operating margins. At the risk of stating the obvious it’s an almost freakishly high quality outfit. Ordinarily you therefore wouldn’t expect to see Whitbread trading at pretty much the exact same value multiple as Starbucks stock unless there was a huge growth premium in play. As it happens they have seen virtually identical growth in revenues over the past few years (12.7% annually for Starbucks versus 12.8% annually for Whitbread) – not entirely surprising given Costa Coffee now makes up around 35% of Whitbread’s revenue. On the earnings side of things we have annual growth rates of 19% for Starbucks shares versus around 15% for Whitbread. Once you weigh that up versus their similar earnings multiples it becomes quite difficult to justify Whitbread’s Q1 2015 earnings multiple of 27x profits. Okay so that’s the basic lie of the land, and has set the stage for the tumble in value that Whitbread investors have experienced over the past eighteen months or so. From trading at well over £50 a share in the spring of 2015 the shares are currently changing hands some 33% lower at £36.25 per share. This is now a pretty much textbook definition of what Peter Lynch had in mind when he was talking about growth at a reasonable price (GARP). In fiscal year 2015/2016 (that’s the twelve months to March 2016) the company posted total revenue of £2.922 billion of which approximately £390 million ended up as net profit for shareholders. 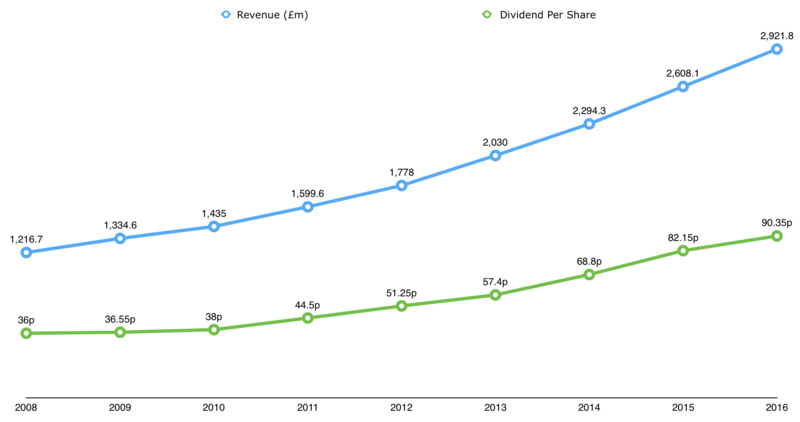 In per share terms that works out to earnings of £2.14 and a P/E multiple of 17 given the current £36.25 share price. As for this this year, revenue for the hotels and restaurants segment of the business was up around 9% whilst at Costa Coffee the figure was just under 11% over the first six months. Of those two figures same store growth (i.e. excluding growth from new premises) came in at around 2.5% and 1.5% respectively. All-in-all the company will likely generate something like £2.40 a share in net income for stockholders – putting them on a forward P/E ratio of 15x earnings. Even with limited future growth that would make for a compelling investment case, however management are targeting a total of 85,000 U.K. rooms in Premier Inn by the end of the decade as well £2.5 billion in system sales from Costa Coffee over the same period. 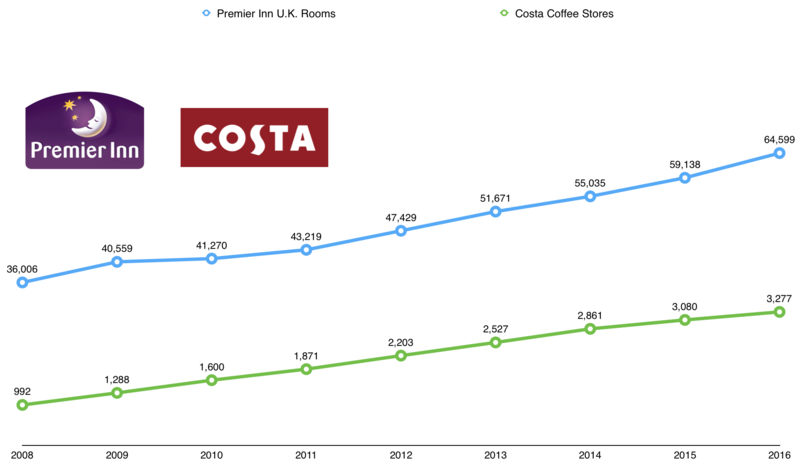 For comparison in the first half of fiscal year 2017 Whitbread reported around 65,770 Premier Inn rooms in the U.K. and £845.1 million in Costa Coffee system sales. In exchange for that valuation you get a company that posts double digit returns on capital and operating margins of around 18%, along with a history of stable revenue and earnings growth of around 13%. In addition the stock is paying out a 2.7% cash dividend distribution that has grown by 11.5% over the past decade and which still only represents around 40% of net earnings as it stands today. You can therefore afford to be pretty conservative with your long-term growth estimates whilst still coming out with good shareholder returns. Given the information concerning Premier Inn and Costa Coffee let’s say you project that average revenue and earnings growth will come in at around 7% over the next decade. In addition let’s also project that the previous year’s £0.90 per share dividend will at least grow in-line with earnings during that time. This seems to be a fairly reasonable assumption given the 40% current pay-out ratio. Finally, we’ll also use the long-term average P/E ratio of 15 as an end point for how the market will value the shares ten years down the line. It could be more or it could be less at any one particular moment, but that’s pretty much the average historical valuation for Whitbread stock. Once you plug in those figures you get to a terminal share price of £71.50 along with an additional pile of cash dividends worth around £13.40 per share. As far as FTSE 100 stocks go at current valuations to come out with double digit annual returns on a ten year horizon pretty much represents the textbook definition of GARP.